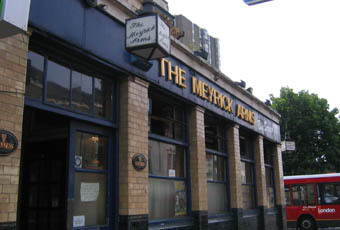 I lived a hop skip n a jump from this pub for two years 03 04. Being an Aussie I found it to be a typical old run down local boozer which for me being Australian it was something I had never experienced so therefore was interesting. The interior seemed to be old and cheap. As the beer offered was cheap too. I once tried to steal a half pint once and was caught by publican, he made it known to all the patrons therefore telling me to give it back. I then offered to purchase one which I did. It was pretty trashy and old, and yes odd smells were present but it was cheap and just a stop off on our way to other bars. For me being Aussie it was certainly different. Death's waiting room. Near the station, yes, but worse than even what that implies. Foul, dingy, to all intents and purposes on its last legs. Nightmarish. Oh my god, I feel sick.